A Fold Apart is an award-winning 3D puzzle game from Lightning Rod Games, that explores the emotional struggles of a long-distance relationship through a unique new mechanic — folding paper! After career choices force them down separate paths, Alex and Sam vow to make their relationship work despite the challenges of living apart. Though they frequently communicate through text messages, misunderstandings are inevitable and cause the characters to erect emotional barriers that physically bar their path. By folding the pieces of paper these characters inhabit, players are able to help the couple safely navigate around their relationship hurdles and find a way forward. 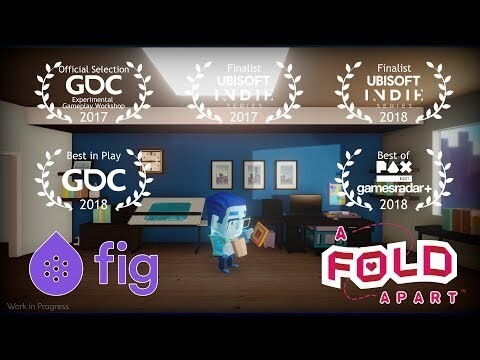 With over fifty unique paper folding puzzles exploring the emotional journey of a long-distance couple, A Fold Apart is sure to touch the hearts and minds of puzzle gamers everywhere. The upcoming A Fold Apart PC and Switch release date is June 2019 in the US and the UK. Notify me when A Fold Apart is available.